I couldn’t decide who the star of this post was going to be, at first I was leaning towards the nutty brown rice salad using my favorite sprouted rice from Planet Rice. Or maybe it should have been the juicy grilled chicken skewers, gahh being a Pisces makes for a bad decision maker so I just chose both. I’m so lame at making decisions which is why I check restaurant menus on-line before I arrive, true story but for another day. I’m not saying you need to make both though, the salad will melt your socks on it’s own and has the ability to bedazzle any plate of food hot or cold. 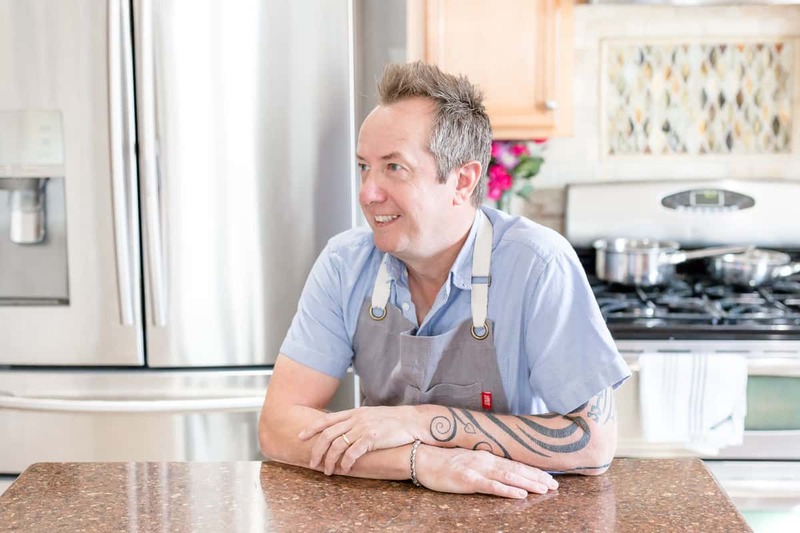 Personally I prefer it cold but that may be because of the early California summer and the last thing I want to do is crank up the heat in the kitchen. You can usually catch me out in the yard with something on the grill, tongs in one hand and a wine glass in the other. The brown rice is packed with crunchy bits. Water chestnuts, snow peas and toasted cashew verify the healthy check box and there’s even a little sweetness thrown in by adding some diced pineapple. The dressing has a sesame oil flavor with honey and orange juice and as with almost all of my salad dressing recipes, you’ll probably have a little extra. But this time instead of shoving it in the fridge, grab a pastry brush and glaze those chicken skewers with it as they come off the grill and then glaze them again…and again. Hey, here’s some more tasty grilled chicken recipes for ya! 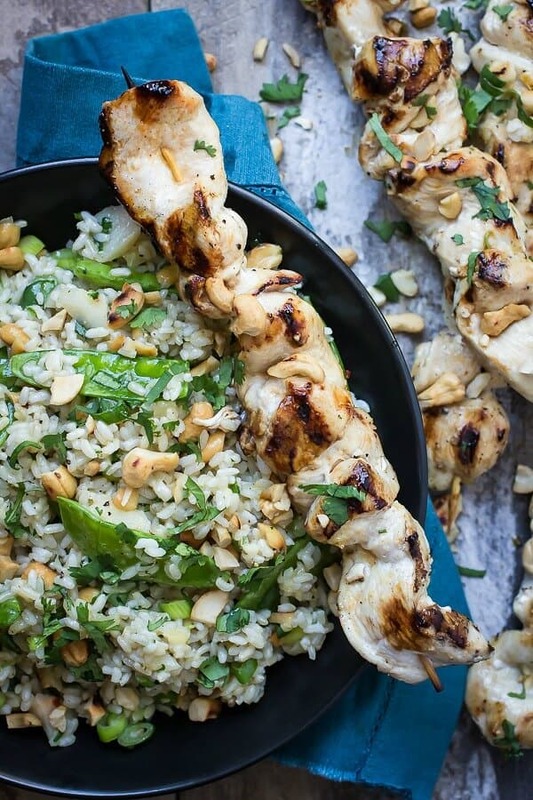 Juicy grilled chicken skewers served with a brown rice and snow pea salad. Place the orange juice, honey, cider vinegar, garlic, salt, red pepper flakes, sesame oil and ginger in a bowl and whisk until well combined. Add the olive oil in a steady stream while whisking. Set aside. In another large bowl, combine the cooked rice, pineapple, green onion, cashew nuts, water chestnuts, cilantro and snow peas. Add 1/2 cup of the dressing to the rice and toss well. Slice the chicken into thin strips and attach to wooden skewers. Preheat the grill to high and place the chicken directly on the heat. Cook for about 5 minutes and then turn over to cook for a further 5-7 minutes. Once the chicken is fully cooked, use a pastry brush and any leftover dressing to coat the chicken. Serve at once with the rice salad. 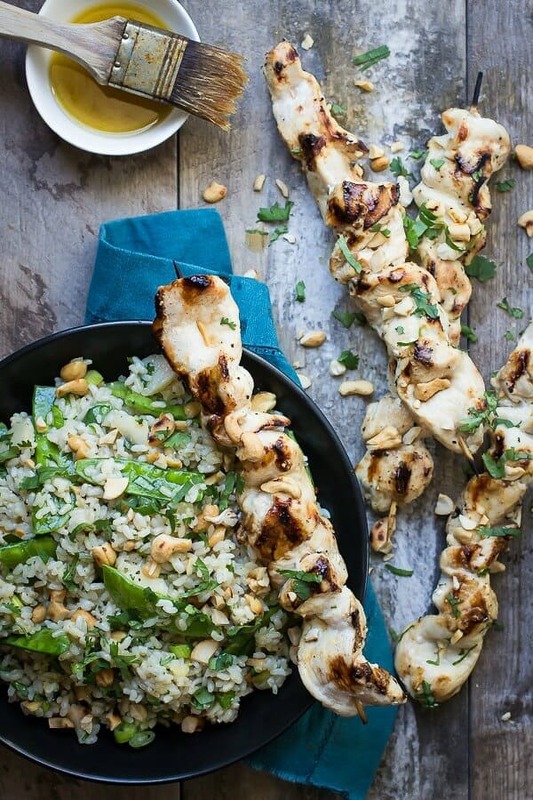 Chicken skewers make the world go ROUND and ROUND! The skewers, the salad, my mouth wants it all! Totally drooling over the fact that you added pineapple to this rice too…my favorite fruit. Gorgeous photos as always – pinned! Thanks Taylor, it tasted pretty awesome! 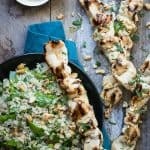 I love chicken skewers, and this rice salad sounds amazing with all of those delicious flavors! Yum!! The salad looks so flavorful and healthy. And I love the dressing! I’m sure it goes beautifully with the chicken too. Thanks Mary :) It sure does..
Chicken skewers are the best and then you add that salad – what a killer meal! You had me at melt your socks. Wow, this meal looks amazing. Definitely a summer must-make for sure.